Click once or twice on the picture to enlarge. 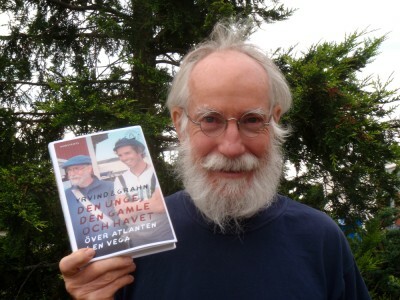 The book: Den unge den gamle och havet, is now in print and for sale on internet in book shops and signed copies from me and my co-author Thomas Grahn. Nineteen year old youth and his freind calls on Yrvind a seventy year old experienced small boat sailor to get advise for their dream cruise. After a few houers consulting they part. Weeks pass. One day Yrvind phones curious about their progress. My freind jumpt ship, says the Captain. You must sail single-handed, says Yrvind. I have never been away from home for more than a week, the longest I have sailed is across to Denmark, and I have never been sailing at night. I lend you a sextant and an inflateble. If the worst comes to the worst I give you a hand for start. A week later Captain phones back. If you give a hundred percent I will give a hundred percent, but we must hurry, soon the authum storms are here. We got a month. Followed by calamity howlers the odd duo departs, the old man and the youth bearing the heavy burden of being the Captain. After enduring storms, a broken down engiene, blown out sails, a leaking boat they finally exultant reach Florida after a in many ways an unique sail. It is a practical, instructive book for people with big dreams and small budgets, enjoy.